You'll start your day driving out to Cajun Country, where you'll go through wild cypress swamps, over the Mississippi River on an impressive suspended bridge, and along vast sugarcane fields, as the guide tells a unique story of the odyssey of the Cajun people. Next you'll take a narrated boat tour (about 1.5 hours) on winding bayous in remote cypress swamps. Your Cajun guide, also an alligator hunter and fur trapper, will share his knowledge of the swamp including reptile habits, healing plants and exotic birds. After this peaceful ride, explore his picturesque swamp zoo on Bayou Boeuf. A delicious lunch is included at Oak Alley Plantation's Cajun restaurant with a chance to experience traditional cuisine of this region. After lunch be prepared for a pilgrimage back in time. From the River Road you will see and hear all about Whitney, Josephine, and Evergreen Plantations. 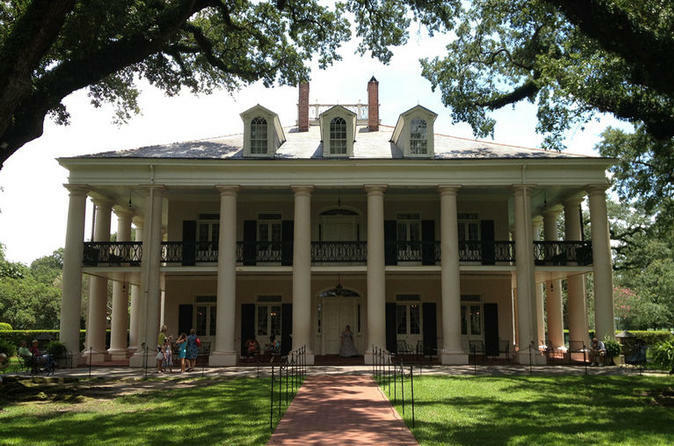 A guided tour of Oak Alley Plantation to admire this jewel of Greek Revival architecture. Free time to walk under a spectacular canopy of 28 giant live oaks. Next visit Laura, a Creole Plantation and her historic slave quarters surrounded by sugar cane fields. The guided tour transports you with dramatic detail into the charmed yet tragic lives of four generations of Creole owners and their slaves. Upgrade to the High-Speed Airboat option, to experience a thrilling ride as you comfortably glide over marshes and into deep, secluded bayous.